If you want to know why Animals, Whores & Dialogue stands out from all the other documentary movies about Hunter S. Thompson, take one look at the cover of the DVD and you will find the answer. The image used is that of Hunter sitting in front of his typewriter, at work on his Hey Rube column for ESPN, which encapsulates the very essence of this documentary. 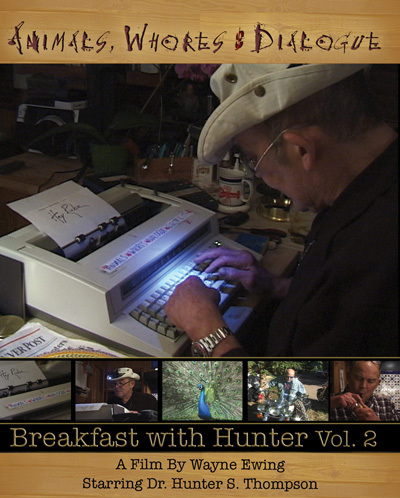 The previous offering from Wayne Ewing, the rollicking Breakfast with Hunter, opted for a cover featuring the infamous Gonzo logo, which similarly reflected the direction of the film. That is not to say that the first instalment presented an unbalanced portrait of Hunter, but rather there was a mixture of both man and myth. Contemplative moments at Owl Farm were counterbalanced by the more hectic elements of life on the road, with Hunter living up to his Raoul Duke persona. With Animals, Whores & Dialogue however, Ewing opts for a straight ahead portrait of the writer at work. The fact that the film is still absolutely enthralling is a testament to both director and subject. Writing is not a spectator sport and is usually a solitary, lonely affair. However the normal rules never apply when Dr. Thompson is around and it is no different here – the Gonzo slogan “We’re not like the Others” is certainly the operating ethic. For Thompson the art of writing was something of an event. What Ewing subsequently captures is truly remarkable as we bear witness to an evening in the kitchen at Owl Farm, with Hunter naturally taking centre stage. The comfort between Hunter and Ewing is clearly evident, as the presence of the camera appears to go virtually unnoticed, with Hunter alternating between relaxed conversation and silent contemplation. There are flashes of his infamous temper however, as the pressure involved in the creative process boils over, usually as a result of somebody speaking at the wrong moment and breaking his concentration. There are two key elements that emerge from all of this – the first being the importance to Hunter of the people around him, from the ever attentive Anita Thompson, to close friends like Bob Braudis and Curtis Robinson – and second the serious and methodical approach that Hunter took to his writing. In terms of the latter, Animals, Whores & Dialogue is the perfect antidote to the misguided belief that Gonzo Journalism involves a somewhat haphazard approach to writing, that somehow all that is required is a bottle of Wild Turkey and some illicit substances. The documentary therefore is very much in the same manner as The Proud Highway and Fear and Loathing in America, in that it clearly demonstrates the reality behind the wild public persona of Hunter S. Thompson, with that being the creative force of the contemplative writer. Throughout the film there are several asides that reinforce the above superbly. We are treated to the sight of the venerable George Plimpton at a party celebrating the 25th anniversary of Fear and Loathing in Las Vegas, where he speaks of his regard for Hunter. There is also a great segment filmed in Louisville, at an evening in honour of Hunter, with tributes from Douglas Brinkley, Warren Zevon and not to mention the amazing David Amram. Interestingly, Ewing also uses the film to draw a connection between Hunter’s previous work and his ESPN column, which works to great effect. While discussing the background to the writing of Fear and Loathing in Las Vegas, Hunter delves into his investigation of the murder of Ruben Salazar and the circumstances surrounding the case. The same anger that he felt at the injustice involved is mirrored by his reaction to the Lisl Auman case in Denver, in which he first articulated his disgust through ESPN, leading to a public campaign for justice that lead to her eventual release (as covered in another documentary by Wayne Ewing – Free Lisl). Another striking element to the documentary is the seemingly prophetic nature of Hunter’s ESPN column. This is evident from the very beginning, with Hunter discussing the War on Terror and the economic mess perpetuated by the Bush regime. While he may not have witnessed the election of Barack Obama, it appears that despite the change in leadership, some things never change, with Hunter’s verdict on the economic recovery under Bush bearing more than a little relevance to today – “A jobless recovery is not a recovery; it just means some people are making more money.” His reaction to 9/11 is even more startling, with his prediction of the aftermath bearing out with chilling accuracy over the past nine years – “It changed everything, it changed all of us since then, for the worse I believe…I’m glad I’m not 22 years old.” When you see this and read his ESPN column in the aftermath of 9/11 it makes for some sobering thought. All in all this is truly a wonderful documentary by Wayne Ewing, that will both delight fans and also serve as a fitting portrait of a true American original. In that sense Ewing’s achievement cannot be lauded enough.